Realistic and unique Pendulum Clock 3D screensaver will impress everyone who likes screensavers, clocks and 3D effects. You will see analog clock mechanism from three different points of view. It is really working clock model with pendulum motion and yoke switching seconds. 12 gears made of copper and steel are rotating with hook. Clock face is gold with cutted numbers. Clock body is made of glass – to let everyone see its mechanism. Each gear has its own number of tooth to make clock show correct time. Interesting background design is not annoying, light effects are smooth, colors are gold, red and grey. Hour, minute and second clock hands will show you exact time. We hope you will appreciate balance of this free 3D screensaver. Surprise your friends, co-workers, relatives and kids with your PC desktop decoration. 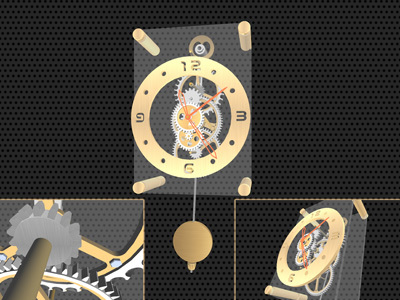 Do not hurry, feel the time, meditate with Pendulum Clock 3D Screensaver! It is compatible with any screen resolution and any screen ratio.